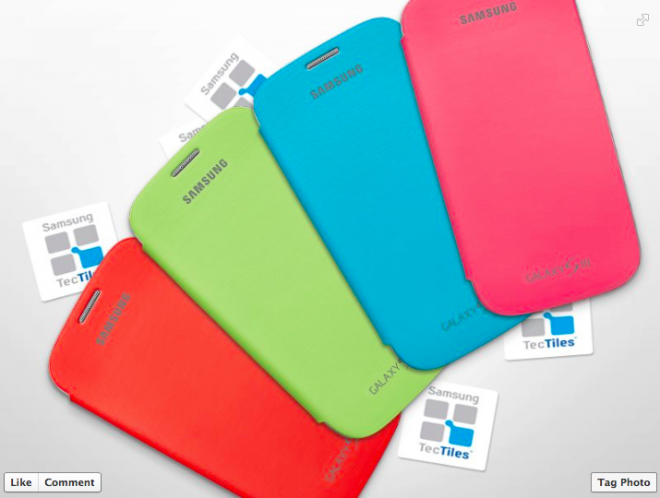 Galaxy S III and Galaxy Note II owners take note as a special offer will help you score a free flip cover and NFC Tectiles just by registering on Samsung’s Facebook page. Samsung’s Flip Covers retail for around $39.99 and with your choice orange, green, blue and pink along with 7 different Tectile options, there’s little reason not to take advantage of this offer. That’s not all from Samsung as they are also throwing in a 50%-off coupon for the accessory of your choice on their official web store. Even if you aren’t a Galaxy S III or Galaxy Note II owner, you’ll still be able to take advantage of the 50% off coupon all by registering on Samsung’s Facebook page. All you have to do is hit the Facebook link below, enable the Samsung application, register your device and score your freebies. This is a limited time offer good from 12/28 to 2/11/2013 and the offer is limited to 10 items per shipping address. The 50% coupon on accessories is good for mobile accessories only. So it’s a scam because you didn’t get the free item lol? Stop it man, lol. No, it’s a scam because it involves Facecrook. No its a scam because it doesn’t say limited supplies. You should pick up a dictionary and learn what the word “Scam” means. As in Scamscum aka Samsung I already know all about it thank you. the worst manufacture in the business. free lasted two hours only. but 50% is still good. besides, the not longer free colors were not worth it. That was fast, they already went through their 12,000 offers. 6-8 weeks my free orange note 2 cover will be on the way! This promo was already advertised in numerous blogs yesterday around noon so most cases have already been claimed. I was able to get one for both devices, but they went really fast. Shoulda read the comments before I just went through all that. I wonder if they really did give away that number. too bad i missed the boat. but i guess with SO many people owning the device, it would be easy to see how it was cleared out of freebies quickly. anyone using tech tiles? does it drain your battery keeping nfc powered on? From what I’ve read, not really. It is a very minimal battery drain. Then again, on my Note 2, I wouldn’t notice… I keep everything on. getting one in 6 to 8 weeks yei!! Well, at least was free. I registered mine at 8pm last night and am still waiting for the email. Guess I don’t even get the 50% off either. I wonder if I qualified if I had already registered my gsIII back in June. This is old news, they were all gone yesterday Nothing wrong with David enjoying his Holidays and slowing down on the news. They were not gone that quickly…I think some of you are just upset you were not able to get one. Sorry but I’m not dumb enough to be on Facefraud. damn it, why am i only getting 50% off coupon?!!? !